"the mutable meaning of a supposedly immutable book"
Last Sunday in the Open Door class at Southwest Central, my dear friend ABCE read a portion of Isaiah from the King James Bible. I found it hard to follow although it would probably have been much easier if I had just listened to her beautiful voice and phrasing. I'm no mean Elizabethan scholar having devoted 5+ semesters to it at Rice. I grew up on KJV; it's the text that often comes first to my memory thanks to my dear great aunt, Helen Calahan Karr, and sword drills at South Plains Baptist Church. 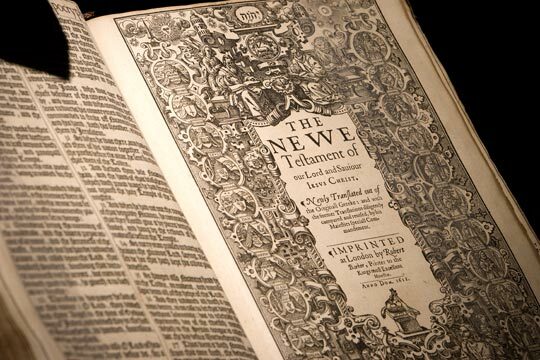 In many ways it is the best translation of the Psalms in English--still after 400 years. A few weeks ago I went with some church friends and my mother-in-law to the Dunham Bible Museum at Houston Baptist University. Touring the museum it's very easy to see that it is "God" who is "the same yesterday, today, and tomorrow" because it is most certainly not biblical text which changes transmission mode (oral, written, digital) and media (stone, animal skin scroll, papyrus folio, paper & ink, printing press) and language (Hebrew, Aramaic, Greek, Latin, English, and countless others) over centuries. People's interaction with text changes, too. It's fun to revisit discussions of what is and what is not part of the canon. People change as societies and as individuals, as I learned when when I was trying to track the text in my New English Bible (Oxford University Press, 1970) while Andrea read her KJV. Even her Bible looks little like the edition that first came off Gutenberg's press. Some of the more modern versions read by other class members are just so simple that I worry about lost meanings, missing sub-texts, and literary structures that have been rendered invisible. In odd moments, I've been turning these things over in my mind probably because of a ChLA 2011 session which I chose only because I'd lingered too long over morning coffee and conversation and it was being presented in the classroom next door. "Evolving Cultural Images in Illustrated Books" was a hodge-podge panel with environment/nature books and a lovely presentation by Anne Phillips on illustration in The Secret Garden by Frances Hodgson Burnett entitled "Crocuses, Robins, and Rosebuds" and her presentation was a charming as her title. However, the presentation that has lingered in my thoughts was Benjamin Lindquist's "The Evolving Images of Kenneth N. Taylor's Illustrated Children's Bibles" which looked at examples from 1956, 1989, and 2002. He began with a quote and I missed the cite: "books are more than the words they contain." Starting with a rather gruesome picture of Absalom that his wife (and I) remembered from childhood Sunday School, Lindquist showed examples of how biblical illustrations, especially those for children, were softened and sentimentalized throughout the 20th Century. Taylor's Children's Bibles used the same text over fifty years while changing illustrations in each new edition "reflect[ed] inarticulated social assumptions." The books themselves changed from large books which format, paper, and font size indicate are intended to be read to a child by an adult to smaller books, thicker paper, larger font sizes--books that are "child friendly" and which the child might access for herself. The illustrations change from "high art" to sentimental art to cartoonish drawings lacking perspective. The change represents more than a change in artistic style; it reflects societal views of childhood, of parental authority, of the place of worship, of God. The age of child characters frequently became younger, encouraging a little child to insert himself into the more adult text. Such changes also make the Bible more like every other book on the child's shelf or in the toy box. Is it possible that some of these changes undercut the Bible as a "book like no other" and as "the word of God"? Since such books and their pictures are "the child's first introduction to the divine, to the practice of religion," Lindquist proposes that it is well to consider the "mutable meaning of a supposedly immutable book." Using the story of Samuel's waking in the night to God's voice calling him, Lindquist showed how these changing illustrations change the reader's view and introduce a changing theology. In the earliest illustration Samuel's experience is mediated by Eli and a transcendent God is visibly present in items of scroll and Temple lamps and in the moon & starlit sky of His creation. By 2002, Eli is left out of the picture and a very young Samuel himself pulls back a curtain of the Temple There is no scroll, implying that Samuel's experience is not subject to scripture. There are no items of worship. If God is represented, it is only by Samuel's own glowing face and the source of light is not clearly defined as external or internal to Samuel's self. I'll never again look at Bible illustrations in the way I once did. He also showed some Sunday School hand-out illustrations from 1925 and the print that hung in my bedroom as I was growing up. 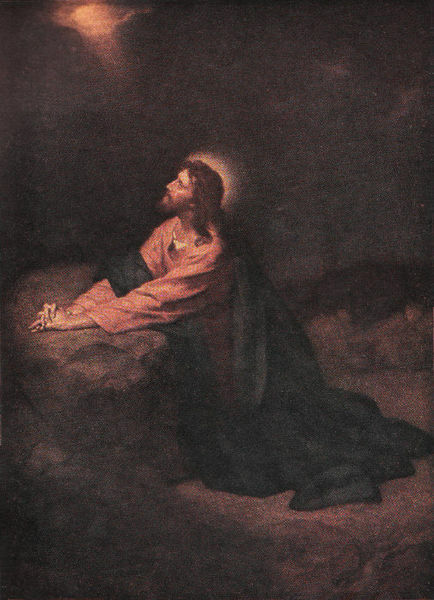 It's from an 1890 painting by Heinrich Hofmann; the colors in our print were somewhat faded from exposure to the light. Even as a very young child, I loved this print. I suppose it was an icon for me; it encouraged me in my daily Bible readings and called me to prayer. If I woke up frightened in the night, I'd shine my flash light on it and be comforted. The print remained on the wall of the bedroom when I went to college, but still today when I turn off the lights and close my eyes, I think of it. It's still calls me to prayer. It's still a comfort to me. Frances Hook. Soft and Sweet. Timothy Botts. The text is the illustration. And the 19th Century favorite, Gustav Dore.